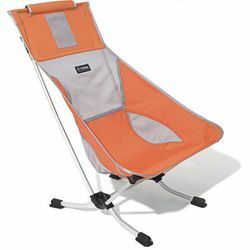 Helinox Beach Chair. A versatile camp chair for sticking your toes in the sand, keeping your backside out of the dirt, and keeping your eyes on the sunset. A super comfortable and supportive back and neck rest along with the simple shock cord poles make this the must have chair for just about any occasion.